Cover art for New X-Men #121. 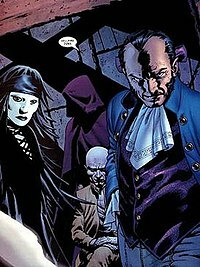 Cassandra seemed to have returned in her original form in the "Danger" story arc of Astonishing X-Men, alongside Sebastian Shaw of the Hellfire Club. However, it is revealed that she is merely an illusion created by Emma who is acting out post-hypnotic suggestions implanted during Cassandra Nova's previous appearance. This infiltration occurred when Emma tricked Cassandra into entering what appeared to be her original body: Cassandra managed to plant a seed of her consciousness into Emma's brain. She then played up on Emma's survivor guilt over not perishing during the Genosha massacre and also her general guilt over her past life as the villainous White Queen in the Hellfire Club. Nova implanted suggestions that exploited Frost's guilt at surviving the destruction of Genosha in New X-Men #115, and Emma convinced herself that her survival was due to Cassandra Nova catalyzing Frost's secondary mutation. In exchange, Emma was to assist Nova as part of a scheme to infiltrate the X-Men as a sleeper agent with Nova having erased the memory of their encounter at the time. Cassandra's influence resulted in Emma creating manifestations of Cassandra in her human form, Sebastian Shaw, Emma's younger self as the White Queen (calling herself "Perfection"), and Negasonic Teenage Warhead, a former student of Emma's who was killed in Genosha. Emma and these manifestations then proceeded to attack the X-Men; Beast was reduced to a feral animal, Wolverine regressed to his past James Howlett identity as a timid child, Kitty Pryde lost control of her phasing ability, and Cyclops lost the use of his powers and was rendered catatonic. Meanwhile, Emma/Cassandra subjected Kitty to a cruel dystopic vision that tricked her into using her phasing powers to open the containment chamber where Cassandra, trapped in Stuff's form, had been imprisoned. Cassandra's plans were foiled by a revived Cyclops, and other students at the Xavier Institute (including Blindfold and Hisako Ichiki). Cyclops revealed that while "Cassandra" had influenced Emma to recruit Kitty to free her from the container, Emma had subconsciously recruited Kitty to the team to kill her in the hopes that this would thwart Cassandra's plans. Cassandra then attempted to have Emma transfer her mind into Hisako. While Cassandra was attempting to manipulate Emma on the astral plane, Scott was talking to Emma in the physical world, trying to convince her to return Cassandra's mind to Stuff. Emma's only response was to say "Go to hell," though it is unclear whether she was talking to Scott or Cassandra. It was never revealed if Cassandra's possession of Hisako was successful or if Emma returned her mind to its prison. After Jean Grey returns to life and sets about establishing an official mutant 'nation', she is secretly observed by Cassandra Nova, who had in fact escaped from the X-Men’s clutches by using her psychic powers to hop from host to host, and at some point she took possession of the Ambassador from the United Kingdom in the United Nations. When Jean confronted the United Nations, she unbeknownst disrupted Cassandra's finely-laid plans, and now Cassandra vows to tear down Jean's efforts. She also created a microscopic sentinel tech which she then used to controlled governments by implanting it in the brains of several humans. These infected humans become mutant-hating machines, with no self control and ready to take down any mutant who so much as looks at them and while the Red team of X-Men, still oblivious about the threat of Cassandra Nova, were able to find a way to turn off this sentinel tech, the thought of finding every single infected person is overwhelming. On the other side of the globe, Nova-controlled governments are threatening death to all mutants. The Polish army nearly succeeds, but the Red team steps in before things get bloody thanks to Jean’s telepathic powers and Namor's intervention. Cassandra Nova also had recruited an unwilling Forge to her cause and reveals that her mutant hatred is motivated by her near-death at the hands of her brother Charles Xavier. She later reveals herself to Jean Grey while the later was using Searebro (the undersea Cerebro unit) to watch as the waves of anti-mutant hatred wash over the world and simultaneously sends also an unwilling Jamie Carlson aka Teen Abomination to smash Atlantis. When the Brotherhood of Mutants led by the ex-Acolyte Exodus, attempted to attack the Institute, nurse Annie Ghazikhanian decided to leave the Mansion, along with her son Carter, as she felt the place was not safe anymore. As they leave the astral projection of an undetermined person is shown next to Carter's face. Annie seems unaware of this projection. Carter's dialogue and expression at this time hint that he is under the control of this individual. [volume & issue needed] The projection was later revealed by Chuck Austen as the intended return of Cassandra Nova, but on his departure from the books, the storyline was dropped. In an interview, Marvel writer Mike Carey stated that one of the more outlandish storylines he had considered involved Cassandra Nova and another mummudrai. A second mummudrai would arrive from space and impregnate Nova, creating a litter of "young mummudrai gestating in the minds of the X-Men." According to Carey, the storyline "...would have been fun to do, but Joss Whedon got to Cassandra before I did." The mummudrai are usually forced to fight with the mind of their host over a body. However, given the vast potential in Xavier's genome, Cassandra Nova was able to build her own body, mimicking human traits as best she can. Cassandra Nova is able to access the full spectrum of latent mutant functions in Xavier's genome (she seemingly has the powers of Charles Xavier, the ones he could have and the ones he might receive as a result of latent mutation), granting herself vast psionic powers. These powers include telepathy, telekinesis, and a phasing ability. She was able to block the considerable telepathic abilities of Charles Xavier, create psionic armor, disintegrate the complete tissue of Wolverine's arm, and make her body completely intangible to an extent that even allowed her to withstand a direct blast from Cyclops. She has all the powers of the "average" mummudrai as well, which are astral projection and mental possession. Her telepathic capabilities are so advanced that she was able to hide her possession of Charles Xavier's body over quite some time despite directly interacting with considerable telepaths like Jean Grey, Emma Frost, and the Stepford Cuckoos at the same time. Cassandra can also manipulate the DNA she has copied to act as a rapid healing factor or to mimic the voice and DNA of others. First using her DNA copying ability, she mimics Donald Trask III (a relative of Bolivar Trask) so that she can voice command the Sentinels (who obey the Trask family line) to attack Genosha. It has great spiritual and carnal functions and may exercise certain abnormal characteristics in relation to the physical and astral plane. In the Here Comes Tomorrow future timeline, Cassandra's reeducation was a complete success; she had embraced Xavier's dream and went on to become Headmistress of the Xavier Institute. Instead of simply going by the name of Cassandra Nova, she added the Xavier surname to her own, now calling herself Cassandra Nova Xavier. Alongside Wolverine, the three remaining Stepford Cuckoos (now calling themselves the Three-in-One), Beak's grandson Tito Jr, E.V.A., and No-Girl (Martha Johansson), Cassandra became one of the X-Men, fighting against Sublime and its armies of Crawlers, led by Apollyon. Cassandra was destroyed by Sublime after it unleashed Phoenix on the X-Men. On Earth-TRN342, Cassandra Nova has somehow survived for four thousand years and nearly conquered the world as the Great White Owl after she unleashed the Great Corruption and dropped entirely the Veil that separated the Main Reality with the reality of the Revenants, better known as the Mummundrai. As the Revenants were unleashed on Earth, Cassandra becomes their Queen and soon enough Bishop's presence in this reality came to Cassandra's attention. Bishop had been flung into this future Earth after failing in his attempt to kill Hope Summers and soon became a Revenant Hunter, even adopting a little girl named Amber. While on a mission to track a Bull Revenant called the Demon Bear for two months, Bishop and Amber found it in the forests outside a human settlement. Little did they realize that the Demon Bear was part of a trap set by the Great White Owl herself. Bear and Owl attacked, and Bishop held them off long enough for Amber to flee to safety, but ended up being possessed by both Revenants for his heroism. The Revenant Queen intended to use Bishop as a vessel, for she wanted to travel back in time to set off the Great Corruption several thousand years earlier than it originally happened. Re-materializing in the present outside Union Station in Los Angeles, California, the Owl Queen directed Bishop's body towards finding a worthy psychic to sacrifice for the Corruption's rituals. She zeroed in on a new mutant named Ginny Guzman, but the girl was already being fought over by Spiral and a team from the Jean Grey School. The Revenant Queen allowed the Demon Bear to run roughshod over the girl's defenders until she got close enough to project her own corrupted psyche into the child. She left behind a very rattled and confused Bishop and Demon Bear, who were knocked cold by Puck. Eventually Cassandra took possession over the body of Ginny and killed another new mutant psychic to begin the Great Corruption. As the Revenants began to be unleashed by the hundreds throughout Los Angeles, Bishop and his allies attacked the Owl Queen at her base at the Griffin Observatory and, through a complicated sequence of events, trapped Cassandra in the humanized body of Psylocke's Revenant counterpart, and then sacrificed her in a ritual that reversed the Great Corruption before it fully dropped the Veil to the Underworld. During Secret Wars, the Westchester domain of Battleworld contained a version of Cassandra who ran the Clear Mountain Institute, the purpose of which was to condition formerly evil mutants into docile, non-violent people. When the X-Men came to investigate, Cassandra's forces captured them, and she exposed them to the same treatment, seeking to transform them into "pure" and perfect role models for the children of Westchester. It was eventually revealed that this version of Cassandra is actually a female clone of Charles Xavier, created by Apocalypse, and then possessed by the Shadow King. Charles, working together with Psylocke and Cable, is able to remove Shadow King from Cassandra and destroy him, with Cassandra making her escape, and later encountering Joseph. ^ "Cassandra Nova is number 50". IGN. Retrieved September 15, 2014. ^ Garrett Faber. Mike Carey Interview, http://www.chuckpalahniuk.net/ The Official Chuck Palahniuk Site May 11, 2008. Accessed May 24, 2008.